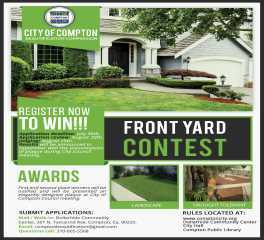 We are pleased to introduce the City of Compton Beautification Commission’s, “Front-Yard Beautification Contest.” This contest is designed to encourage and promote community members who are making the city a beautiful place to live, work and play. The contest is a way for the City to recognize residents whose properties reflect their community pride and their ability to beautify the City one block at a time. The finest landscape in Compton will be recognized and all residents are encouraged to participate. Return the completed by email, walk-in, or mail. • Results will be announced in September with the presentation of awards taking place at Compton City Hall 205 S. Willowbrook, Compton, CA, 90220 during City Council meeting.